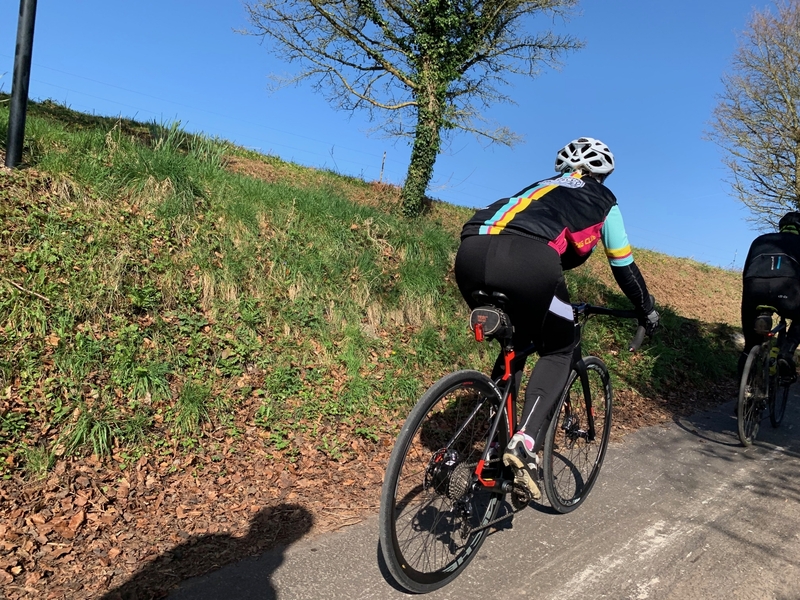 To introduce myself I am a female cyclist in my forty’s, I have only been cycling for just over two years, my first club ride was with cycle club in May 2017. I am not an elite cyclist but do train and regularly enjoy cycling at the weekends. An average ride for me would be at 13-15mph and approximately 40 miles. I get a great pleasure from cycling, it gives me a sense of freedom and achievement, whilst enjoying the stunning scenery. 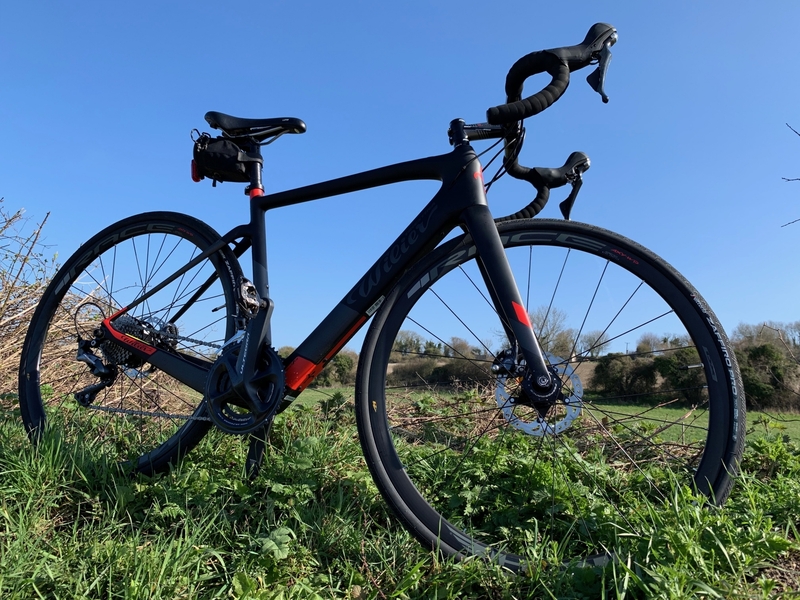 As a member of the Cycle Sphere staff I had the opportunity to test ride the Wilier, and what a better way to test it than on a club social ride; a 36 miler with 2031ft of climbing. As we left the meeting point, my test ride was spotted by a couple of riders, who complemented my steed’s sleek new frame. I couldn’t hold in the secret any longer, I confessed to those riders that I was aboard an Electric bike. Their response was amazing they could now see that the rear wheel hub was a little larger and drum-shaped compared to a conventional bike. It is fair to say they were astounded that it was an electric bike. It didn’t take us long to get to the bottom of one of Hampshire’s finest hills. Normally I would plod up to find the rest of the group waiting at the top. Not today! Today I had choices plod up, un-assisted as usual, plod up slightly assisted, motor up with moderate assistance or sprint up with lots of assistance. Ummm let me think; the child in me decided, pressing the button three times – now in red “boost” mode with 250watts of assistance I launched. I was sprinting with ease past the main group, reeling in the front riders – overtaking the entire group. I must say they were very complimentary about the training I have been doing, along with some tongue-in-cheek comments about e-bikes. I made it to the top first, which is believe me unheard of. When all the group had caught up the conversation really took off. To my surprise even after my electric induced sprightliness, I still had to convince some that it was an e-bike. As you can see even on an e-bike my heart rate increased into zone 4 quite regularly on the inclines with an average of 138 or zone 2. This clearly dispels the myth’s that an e-bike does all the work for you; it can certainly be used to get fit or maintain a level of fitness. The bike stops assisting either when you turn off the electric assist, stop pedalling or when your speed exceeds the Europe-wide limit of 15mph. At the end of the ride the battery indicated between 50 – 75% capacity remaining. I had indulged myself with the use of the red button or max assist, so even if the battery was closer to 50%, I could have ridden the same route again equating to 72 miles and 4062ft. The bike weighs just 12kg which is only a kilogram heavier than my usual bike. This meant that when I was not being assisted it was easy to pedal and didn’t feel like I needed Peter Sagan’s thighs to push the bike on. This is clearly represented in the speed graph above – a significant amount of time was spent over 15 miles per hour or definitely unassisted. 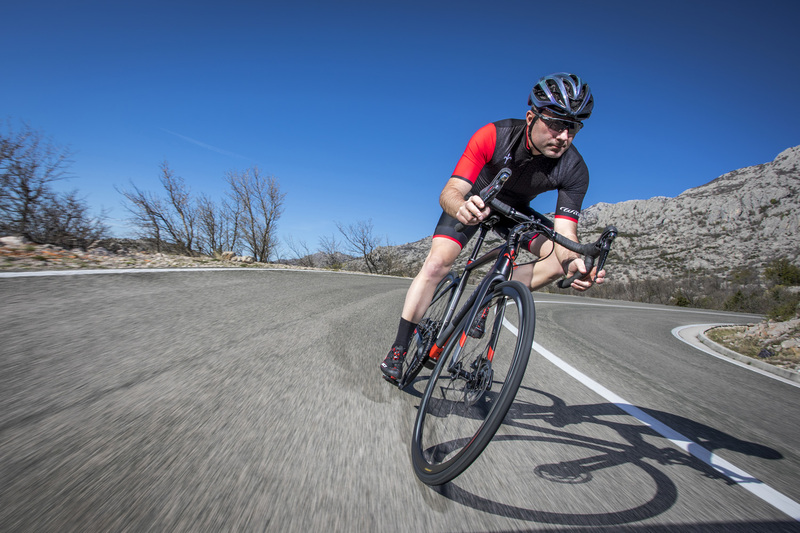 The bike feels and handles very much like a conventional road bike. Gear changing was smooth and easy. 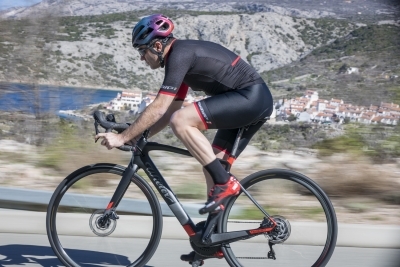 The disc brakes were efficient and very capable. 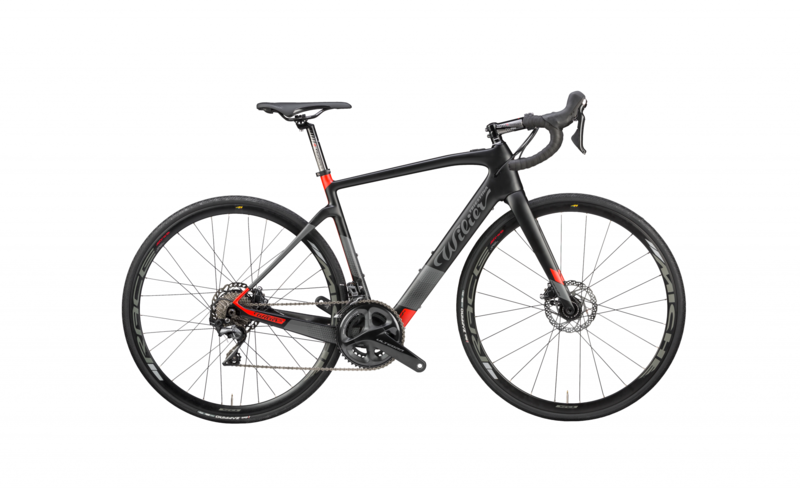 In conclusion the Wilier Cento1, is a very nice bike, it doesn’t scream e-bike and rides like a conventional road bike. Yes! it assists you, however, you have the luxury of choosing how much huffing and puffing you want to do, into wind or on that incline ahead. At the end of the ride I still felt that I had completed a good workout, despite being assisted. Aesthetics ***** Excellent sleek looking bike. Interestingly other riders didn’t initially realise it was an electric bike. I received many compliments about the style and shape. Components ***** Brakes & gears were smooth, wheels responsive and the whole bike was comfortable to ride. Weight ***** Less than 12Kg – Off the bike it is easy to lift and manoeuvre. On the bike, it is not hard work to cycle when the assistance is not being delivered. 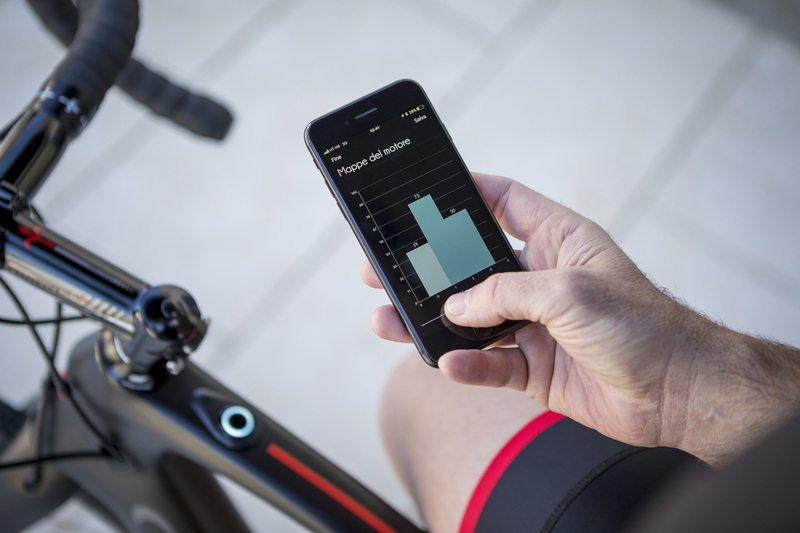 Battery Range **** Due to the inherent riding speed of a road bike often being above 15mph the range is quoted as “elevation assisted riding of 1000-2000m (3000-6000’ depending on rider & gradient (or approx. 1.5hrs of motor-assistance)” On this ride we did not reach the limit with battery indicator showing 50-75% battery remaining having ridden just over 2000ft elevation and 36miles an optional battery bottle range extender is available if your riding is much hillier/longer. Price **** At a smidge over £4000 it is an expensive bicycle! 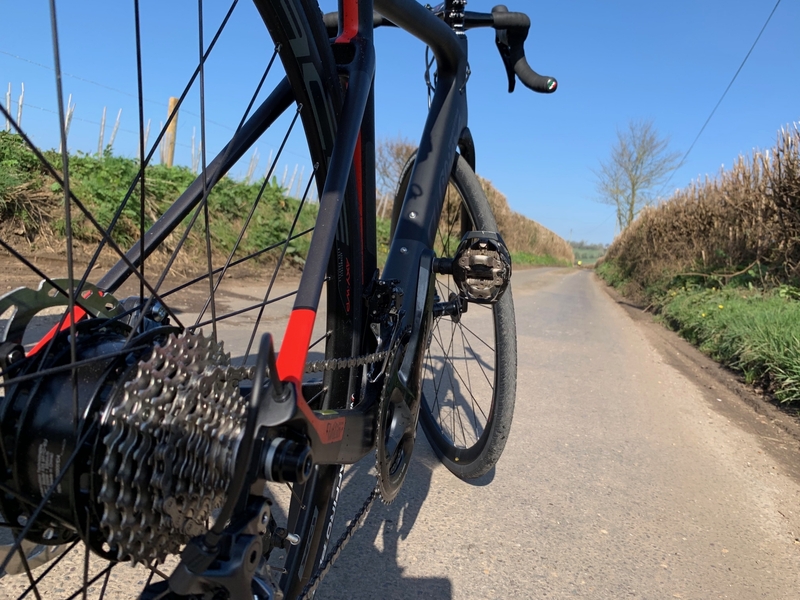 But like most things in life; you get what you pay for; it is a great riding, high specification road bike which also has the benefit of battery assistance when you choose to use it.